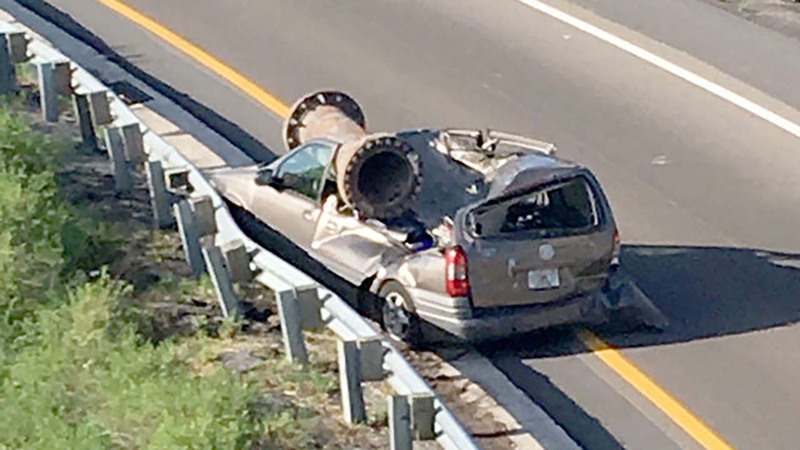 ORANGE COUNTY, Florida -- A man miraculously survived after a large piece of scrap metal fell from a truck that lost control and overturned in Florida on Saturday, crushing his van under the overpass. Jesus Armando Escobar, 36, was exiting off Interstate 4 onto State Road 528 around 7:35 a.m., according to WFTV. Above him on the overpass, Antonio Santiago Wharton, 33, of Kissimmee, was driving a Mack truck loaded down with scrap metal. Wharton lost control of the truck, hit the guardrail, and overturned the vehicle, according to the Florida Highway Patrol. A large metal pipe flew off Wharton's truck, tumbled off the overpass, and landed on the roof of Escobar's Pontiac van. The impact completely crushed the driver side roof of the van, troopers said. Amazingly, Escobar was able to walk away from the crash with only minor injuries. Wharton was cited for careless driving.